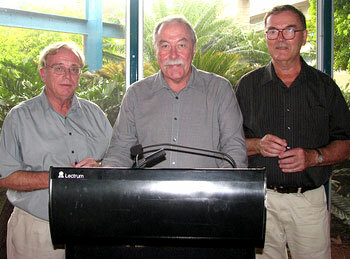 Mr Pauling recently visited Charles Darwin University’s Casuarina campus for the launch of two recent volumes published by CDU Press: The Crisis in Timor-Leste: Understanding the Past, Imagining the Future, edited by Dennis Shoesmith, and The Shadow’s Edge: Australia’s Northern War by Alan Powell. The Administrator said he was extremely impressed at the depth of research involved with Professor Powell’s new edition, which has been punctuated with many anecdotes and personal accounts of World War II. He noted key themes in the book including the role Indigenous people played in the war effort and Darwin’s 13th squadron. “I congratulate the author of The Shadow’s Edge for presenting us with such an excellent history that stands alongside his other valuable publications,” Mr Pauling said. In addressing Associate Professor Shoesmith’s collection of papers, Mr Pauling fittingly described them as “agonisingly poignant and timely”. He also noted the importance of the Timor-Leste conference held at CDU's Casuarina campus last week and events which have since transpired. Mr Pauling noted the importance of the work of CDU researchers in the areas of north Australian history and the Territory’s links with its near neighbours. Further, he acknowledged the role that CDU Press plays in publishing such key volumes.